Revenge, redemption ... and pastry. In the winter of 1912 on the wild West Coast of Tasmania, Wolfftown's most notorious heiress and murderess, Sasha Torte, tells the tale of her own spectacular downfall. Forsaken by her parents and raised by criminals and reprobates, Sasha becomes a world-famous pastry chef at the tender age of seventeen. Entanglement with the disreputable Dasher brothers leads to love, but also to a dangerous addiction. Behind bars in Wolfftown's gaol, Sasha sips premium champagne as she recalls a life of seduction, betrayal, ghosts, opium and an indiscreet quantity of confectionary - and plots her escape. 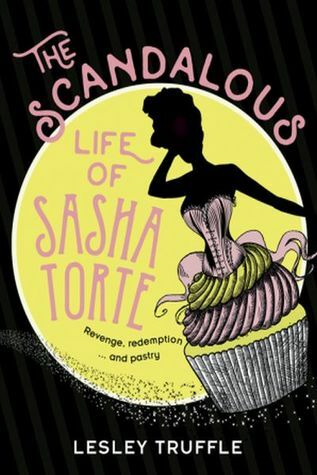 The Scandalous Life of Sasha Torte: revenge, redemption and pastry, is a novel of dastardly deeds, intrepid protagonists, dark villains, wild gangs, luxurious hotels … and murder. During the nineties, I used to watch a TV cartoon called 'Horrible Histories', which was a satirical look at world events for kids. This novel is a little like an adult version of the program for romance readers. It's full of risque innuendo, but we're warned about this from the outset if we want to cut and run. The story takes place in Tasmania in 1912, when the 22-year-old heroine begins her memoir which sets out to explain why she's been wrongfully imprisoned on a murder charge in the old town gaol. The rollicking story takes place in flashbacks, which brings us to Sasha's present, including how she happened to become a world class patissiere. With a play on words name like Sasha Torte, we can predict it's bound to be light-hearted on the whole, but Sasha doesn't gloss over her darker times. In her family background alone, there's a history of bipolar disorder in the women of her mother's side. Of course they never called it that back then, but although it wasn't a recognised condition, they still had to deal with the huge swings between euphoria and crashing depression. To compress so many genre elements within the one story, it has to be fast moving. There are good guys and bad guys, all larger than life. There's mystery and romance, adventure and history, and even bits of natural history. The quiet appearance of a strange creature which turns out to be a Tasmanian Tiger is up there among my favourite moments. On the whole, it got a bit too cute and quirky for me at times, yet I found myself wondering if it was just the sassy writing style that I found a bit much in such a big dose. I'd be interested to see how I'd compare the two mediums if I were to see the same story on the screen. Thanks to Harper Collins Australia and Net Galley for my review copy.